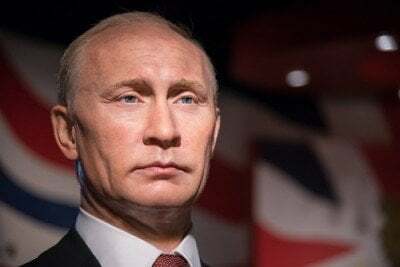 Vladimir Putin in particular, and Russia in general, have been the focus of an intensive high-drama propaganda campaign of late. Are you buying it? For the time being, Russophobia has replaced Islamophobia as the driving force behind the lies. Various US officials have been frantically warning Americans that the Russians are behind everything: hacking the DNC, controlling Trump, influencing the election and breaking the Syrian ceasefire agreement. They might as well add making your girlfriend break up with you, making your toast get burnt and making your car run out of fuel for all the evidence they have presented. Many of these totally unfounded allegations stem from (naturally) the Clinton campaign, home to career criminals Bill and Hillary Clinton, who are desperately seeking to find something to gain some sort of shred of popularity or advantage over Trump, who fills up arenas with 1000s of people more easily than Clinton can fill a high school gym with 50. Many US officials and war hawks are trying to get in on the action; CIA man Mike Morell indicated it would be a good idea to covertly kill Russians to make them “pay a price”; Hillary Clinton called Vladimir Putin the “grand godfather of extreme nationalism” and blamed him for the rising popularity of right-wing leaders; and even standing VP Joe Biden came out and said that, “We’re sending a message to Putin … it will be at the time of our choosing and under the circumstances that have the greatest impact”. It seems there is no depth to which some US leaders won’t stoop in order to gain some political advantage, even it means lying, demonizing and destroying geopolitical partnerships in order to garner a few brownie points. Russophobia is in full swing before the US Presidential Election to distract American voters. You would think Russian President Vladimir President would be agitated by all of this mud-slinging. At times he has been, for instance when he issued a warning a few months ago about an impending WW3 due to NATO’s constant aggression and advancement towards Russian borders. However, judging by his own words and mostly calm demeanor, he has seen through the agenda and understands what is going on. Putin spells out how it’s all inflamed rhetoric before an election season, an old trick used by politicians to distract when they have no meaningful solutions for internal and domestic problems. And that’s exactly what this whole thing is: a giant story. However, as Voltaire once said, if you can make someone believe absurdities, you can make them commit atrocities. Let’s see what else Vladimir Putin has to say on other topics of interest. Blame everything on the Russians. Let’s face it: the whole Russophobia affair is about avoiding blame, dodging responsibility and evading liability. Thanks to WikiLeaks, Project Veritas and many other sources, we know the entire Hillary Clinton campaign has been rigged beyond belief. Fake primaries, fake speeches, fake images, fake videos, fake crowds, fake supporters and fake debates. “On “Judge Napolitano Chambers,” the Judge said that while the DNC, government officials, and the Clinton campaign all accuse the Russians of hacking into the DNC servers, “the Russians had nothing to do with it.” Napolitano then mentioned Binney, arguing the NSA veteran and whistleblower who “developed the software that the NSA now uses, which allows it to capture not just metadata but content of every telephone call, text message, email in the United States of every person in [the country]” knew the NSA had hacked the DNC — not the Russians. Vladimir Putin: sticking it to the US. “There is another mechanism to ensure the transatlantic security, European security, the OC security and their attempt at turning this organization (NATO) into an instrument of someone’s political interests. So what the OC is doing is simply void. Mythical threats are devised like the so-called Russian military threat. Certainly this can be (used to) gain some advantage, get new budgets, make your allies comply with your demands, make NATO deploy the equipment and troops closer to our border … Russia is not trying to attack anyone. That would be ridiculous … The population of Europe is 300 million … and the population of the US is 300 million, while the population of Russia is 140 million, yet such menaces are served as a pretext. Hysteria has been fueled in the US with regard to Russia’s alleged influence with the current presidential election. “Is it known to you that Russia, in the 90s, completely halted (as did the USSR) any strategic aviation in the further afield regions of patrol, i.e. not in the closer abroad. We halted such activity completely. US geostrategic aviation however, with nuclear weapons on board. They continued to encircle us! What for? Who are you concerned about? Or why are you threatening us? We continued with the non-patrol year after year. It is only since about 3 years ago that we restarted aviation patrol further abroad. Which party is the provocateur here? Is it us? We have only 2 military bases abroad. They are known areas of terrorism dangers … US bases on the other hand are all over the world. And you are telling me that I am the aggressor? Have you any common sense? More David Icke humor: right now everything is the fault of Vladimir Putin and the Russians. Surely our American partners must understand that, jokes are one thing, such as creating smear campaigns against Russia, but questions of nuclear security are another thing entirely … they must learn to fulfill their promises. Incidentally, this is the exact same plutonium agreement which made the news last month, when as reported on October 3rd, 216, Russia suspended their deal with the US on disposal of plutonium from decommissioned nuclear warheads. A decree signed by Vladimir Putin lists “the radical change in the environment, a threat to strategic stability posed by the hostile actions of the US against Russia, and the inability of the US to deliver on the obligation to dispose of excessive weapons plutonium under international treaties, as well as the need to take swift action to defend Russian security” as the reasons for why Russia chose to suspend the deal. It’s up to the American public to switch off CNN (Clinton News Network) and all the other duplicitous MSM channels and get truly informed. Vladimir Putin is reaching out his hand to America, in the hope that enough Americans can reclaim their country and work together with other nations in peace. On the issue of Vladimir Putin and Russia, the MSM is not just one-sided, it’s outright lying.